Changes to High-Ratio Mortgage Rates Announced — January 2017 - Distinctive Advisors Inc.
As the Canadian housing market undergoes some significant changes with rising interest rates, changes to mortgage underwriting rules creating barriers to entry in the housing market and increases in property taxes across Ontario, it seems like everyone’s jumping on board to make owning a house more expensive. CHMC has now announced that it will be raising rates on high-ratio mortgages, followed by a matching announcement from private lender Genworth Financial a couple of days later. Mortgages can be divided into two categories from a loan-to-value perspective: conventional and high-ratio. Conventional mortgages are when the borrower has a down-payment of more than 20% and a high-ratio mortgage is when the borrower has a down-payment of less than 20%. High-ratio mortgages are insured through either a private source (Genworth Financial Canada) or a government source (Canada Mortgage and Housing Corporation). To clarify, if your down-payment is less than 20%, you are required as a homeowner to purchase Mortgage Default Insurance that protects the lender in the case you default on your mortgage. 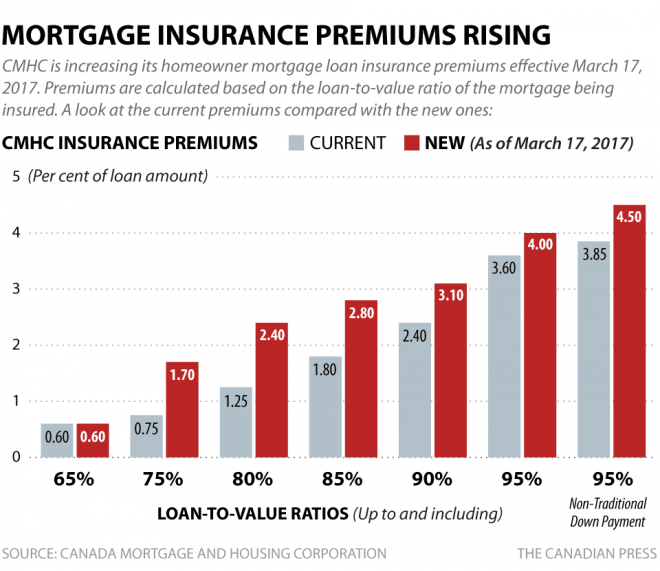 The two main sources of Mortgage Default Insurance in Canada announced recently that they will be raising the rates on high-ratio mortgages in an effort to increase the cash they have on hand to hold against their mortgages (see chart for new rates). According to CMHC, the changes will work out to an extra $5 a month, on average, per borrower. Increased rates are in effect as of March 17, 2017. This will not affect homeowners who have existing mortgages, only new applications received as of March 17. Two days later, Genworth Financial announced they would be matching CHMC’s new rates as well as the date of implementation. Do you have questions about real estate and mortgage financing? Contact a member of our team to find out more.